*The museum will be closed on the following days:"
*The prices in brackets are for groups of 20 or more. *The special period is January through February. *People with disabilities and elderly persons staying in welfare facilities are admitted free of charge. For more information, please read "Free admission to the museum" below. *The special exhibition ticket includes access to the permanent exhibitions. *There may be a separate admission fee for an exhibition held by a third party. Take the east exit from JR Aomori Station and proceed eastwards on Shinmachi dori, turn left at the intersection of Shinmachi dori and Yanagimachi, turn right at the second intersection towards Aomori Washington Hotel. Go on to the second intersection (Kyodokan-mae). The museum is located on the left corner. Aomori City Bus from JR Aomori Station to Shiyakusyo Mae or NTT Aomori Shiten Mae via Kokudo or Furukawa. Eight-minute walk from these bus stops. Aomori City Bus from JR Aomori Station to Shinmachi 2-chome via Shinmachi. Eight-minute walk from the bus stop. We have eight permanent exhibition rooms (numbered 1 to 8) and one special exhibition hall. 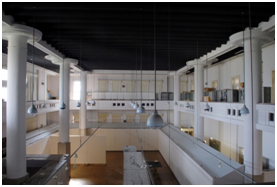 Exhibition rooms 1 to 7 are located in the new building, room 8 and the special exhibition hall are in the old building. The old building used to be the head office of the Aomori Bank. 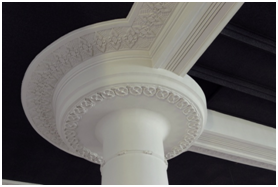 Click here to Old Building, a Registered Tangible Cultural Property. In the permanent exhibition rooms, discover archeology, folklore, history, nature and the leading forerunners from Aomori prefecture. A featured exhibition is often held in the Special Exhibition Hall. 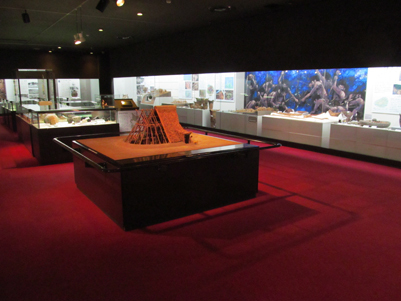 The room displays objects from the Paleolithic age to the Yayoi period. You will discover the archaeological sites and artifacts of Aomori Prefecture. Odai Yamamoto ruins occupy a significant position when considering the migrations of the Jomon period in the Paleolithic Age. The Kamegaoka ruins and Sannai Maruyama ruins are the most important archaeological sites of the Jomon culture that flourished in Aomori. The Suanazawa ruins (in Hirosaki) and Tareyanagi ruins (in Inakadate village) are crucial in the development of rice farming. Aomori Prefecture is blessed by nature, such as the beech forests of the Shirakami Mountains, a World Heritage Site. This room exhibits the animals, plants, and insects inhabiting Aomori with dioramas, specimens, and stuffed animals. In 1984, a gift from the universe landed in Aomori City, now known as the Aomori meteorites. The fossils of the Mount Iwaki whales tell us that Mount Iwaki was once located at the bottom of the sea. 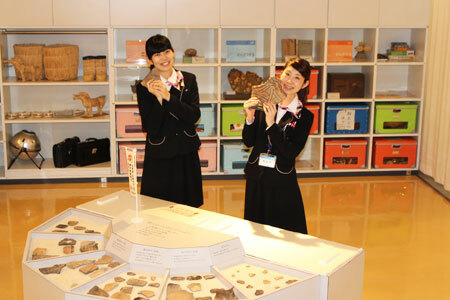 You will learn about how the history of the Earth was associated with Aomori Prefecture through the geological ages, minerals, and other exhibits. 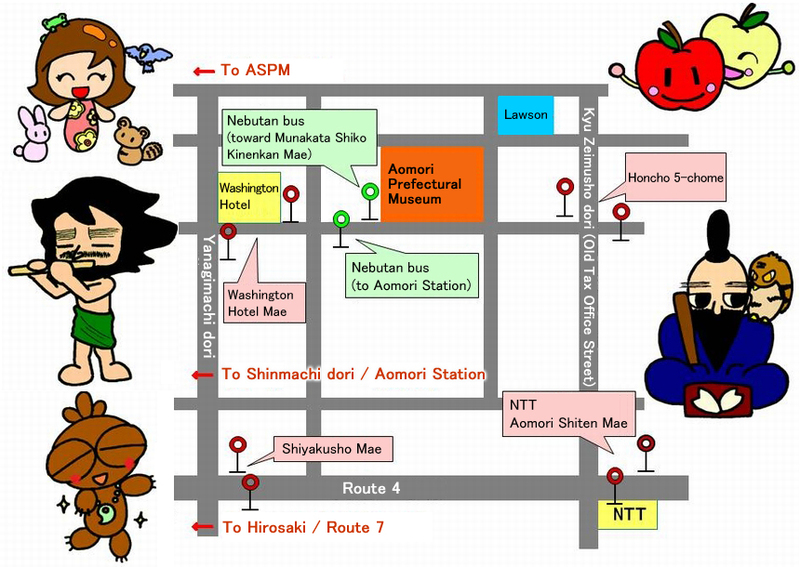 Experience the history of Aomori from the Nara period to the present day. What sort of people called themselves Emishi? Did samurai and farmers in Kamakura, Muromachi, and the Sengoku period have a faith? How did the people in the Nambu or Tsugaru territory live in the Edo period? How did Aomori change from the Meiji and Taisho through the Showa periods? In addition, a variety of objects showing the relationship with the northern world are on show. Aomori Prefecture is located in the most northern area of Honshu. Its weather is very severe However, our life is shaped by the climate. 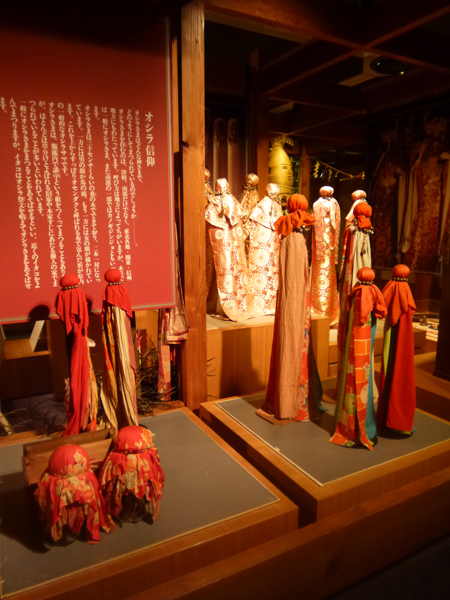 Imagine our daily lives when you look at farming tools or a koginzashi (old needlework) jacket. Please feel the spiritual foundation in the people with faith, Oshirasama or Itako. Apple production is a key industry in Aomori Prefecture. The volume of apples accounts for about half of national production. However, we were facing difficulties continuously until we were recognized as an apple production region. Our efforts in breed improvement and technical innovations built the brand value of Aomori apples. You will see diverse apple varieties and cultivation techniques. 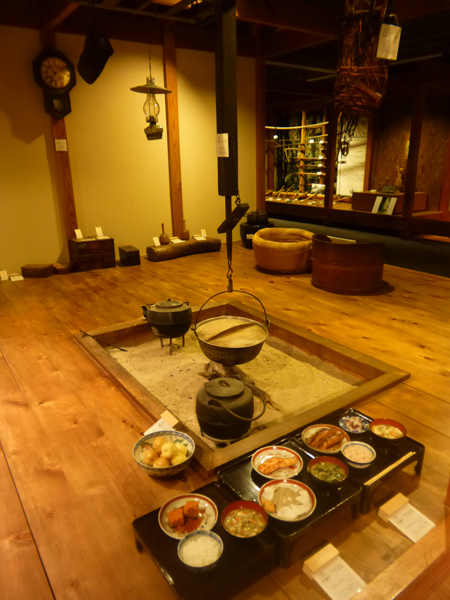 This room is an experience zone for children to encourage an interest in the history and culture of Aomori. They will find old-fashioned tools for daily life and nostalgic toys. We have video materials and books that explain life in Aomori so that children can research and learn about this region. 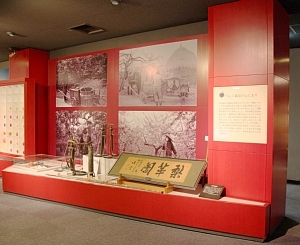 In the Multipurpose Hall, a mini exhibition displaying mainly old tools is held. 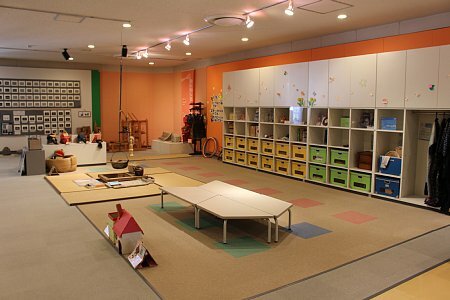 This room has ideas and materials for lessons and experiences or a school trip for elementary and junior high school students. Shiko Munakata, expressed unique sensibility in his artworks and called them Banga (image on a wood panel). Noriko Awaya, turning into a singer from authentic vocalists, left great footprints on the Japanese music scene. We introduce 108 forerunners in Aomori who have contributed to the development of Aomori Prefecture. This room is for the FUINDO collection of mainly excavated articles from the later Jomon period donated by Ko Otaka. The total number of articles in the collection is approximately 12,000. In this collection, 60 magnificent pieces excavated from the Kamegaoka ruins have been designated as a prefectural cultural property. This valuable material has been retained by a local organization even though many of the articles excavated from the Kamegaoka ruins have been scattered nationwide. Hengaku (name tablet) in this room was drawn by Shiko Munakata who named the collection room FUINDO. Explore the beauty of the Jomon period here and in Exhibition Room 1 (Archeology Exhibition). Learn more about the achievements of Hikoei Narita in preserving the cultural properties in Aomori and view part of his collection. Aomori Prefectural Museum was established for the purpose of looking back on the past of our hometown in Aomori Prefecture, seeing the present, and thinking about our future. 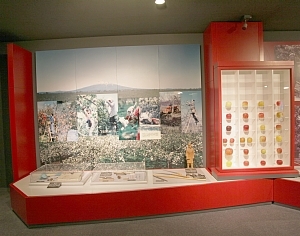 Our mission, as the prefectural museum, is to assist everyone to in learning about the broad aspects of history and the nature of Aomori Prefecture through our activities as a social education institution, including the collection, storage, and exhibition of information or materials, research, and education. Therefore, the museum offers a permanent exhibition for archeology, natural history, history, and folklore, as well as a wide variety of observational and learning opportunities through special exhibitions, feature exhibitions, gallery talks, lectures, and workshops. We sincerely hope you will visit us to find out more about Aomori Prefecture. Aomori Prefecture Meiji Hundred Year Memorial Projects Council submitted a report proposing that an educational institution, the museum, be set up. It would cultivate a spirit of loving our hometown and be seen here with scientific ideas for the celebration of one hundred years since the Meiji period. Governor Takeuchi decided to construct the Aomori Prefectural Museum in response to the report from the Aomori Prefecture Meiji Hundred Years Memorial Projects Council. Acquired the land of the current location, Honcho 2-chome. The old head office building of Aomori Bank located in Honcho 2-chome was transferred. 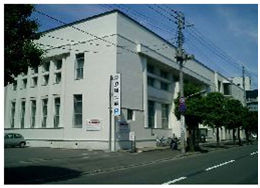 *The former 59th Bank (Daigojuku Bank), Aomori branch office, built in 1931. Designed by Koji Horie. 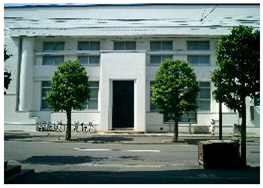 *This building is used as an annex for the Special Exhibition Hall. *The building was designated a national registered tangible cultural property (buildings) in March 2004. Launch of the museum opening project office in the Aomori Prefectural Library. Relocated the museum opening project office to the trustee room in the Aomori Bank head office adjacent to the construction land. (located until November 1972). Received an offer to donate 11,201 archeological items from Ko Otaka (later named the FUINDO Collection). Construction of the main building completed. Received the FUINDO Collection from Otaka. Establishment of the Aomori Prefectural Museum based on the enactment of the Aomori Prefectural Museum ordinance. Held the opening ceremony and opened to the general public on the following day. *Comprised Permanent Exhibition Rooms 1 to 6, Special Exhibition Hall, and small special exhibition. ◆Exhibited the human bone and jar-coffin excavated from Rokkasho in Kamikita in the Jomon period zone. 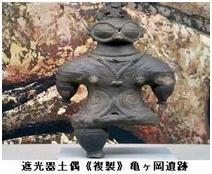 ◆Exhibited the dogu (clay figurine) in the Kamegaoka culture zone, designated as national important cultural property, excavated from Kamegaoka ruins in Kizukuri-cho. Number of visitors reached 300,000 people. Sixty artefacts from the Kamegaoka ruins selected from the FUINDO Collection designated as a prefectural cultural property. Established Special Exhibition Apples and Aomori Prefecture. Exhibited the Chinese zodiac figurine, produced by metalworker Hisashi Kobayashi from Aomori Prefecture, in the entrance hall. Number of visitors reached 500,000 people. Rearranged the Exhibition Room 2 to add a new exhibition, the diorama Creatures Living in the Tidal Pool. ◆Rearranged the local ruins exhibition to exhibit Izawa, Horiai, and Ishigo ruins in Hiraga-cho. 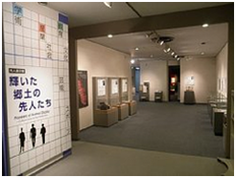 ◆Rearranged the local ruins exhibition to exhibit Chikano ruins in Aomori city. Exhibited the Aomori meteorite in the entrance hall. Aomori Prefectural Museum Visitor Information donated by the Nippon Life Insurance Company Foundation. The number of items in the museum reached 41,029. The number of items in the museum reached 41,532. A large-scale rearrangement of Exhibition Room 5 with the theme, Progress of Aomori Prefecture. Introduced the computer system. Death of Emperor Showa. The name of new era Heisei was announced. Number of visitors reached 1 million people. Rearranged the Exhibition Room 3 The Ancient and Middle Ages exhibition. 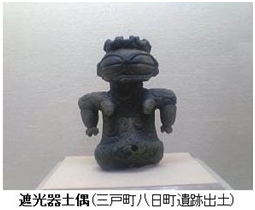 Five hundred fifty-nine artefacts from the Utetsu ruins designated a national important cultural property. Rearranged the Exhibition Room 2 Geology and Weather in Aomori Prefecture to The Land of Aomori Prefecture. ◆Acquired the parking lot adjacent to the west side of the museum. Completed parking lot maintenance. Started the parking service for visitors. A large-scale rearrangement of Exhibition Room 1. A large-scale rearrangement of Exhibition Room 4. Installed new video devices in The Festival and Life exhibition. Held the special exhibition, Aomori is the Spirit of the North of Japan, in Khabarovsk Regional Museum. Three people travelled to Khabarovsk for joint academic research. Then, three people from Khabarovsk visited Aomori. Admission free for The Commemoration Ceremony of the tenth Anniversary of His Majesty the Emperor's Accession to the Throne. Three people travelled to Khabarovsk for joint academic research. Three people from Khabarovsk visited Aomori for joint academic research. Held the special exhibition Aomori and Maine - Bridge Beyond Time - in the Maine State Museum (Augusta City) in the United States. A large-scale rearrangement of the Exhibition Room 3. Opened Exhibition Room 7 Leading Forerunners from Aomori. Changed the names of some exhibition rooms. The Khabarovsk Regional Museum staff visited Japan. They conducted scientific research in Aomori. Secretary Level Council of the State of Maine in the United States visited Japan. ◆Number of visitors reaches 1.5 million people. Amended the ordinances of the museum and added an admission fee for the special exhibition and the permanent exhibition special period. Amended the rules for the museum, then decreased the opening days during the holidays and closing days during the New Year holidays. Three people travelled to Khabarovsk for joint academic research. Then, three people from Khabarovsk visited Aomori for joint academic research. The former head office of the Aomori Bank of the Aomori Prefectural Digital Aomori designated as a national registered tangible cultural property (buildings). ◆The total number of annual visitors reached more than 100,000 people (107,719). Partial Revision of the rules of the museum. Extended the opening hours from 9 a.m. to 6 p.m. In addition, opened on Mondays. 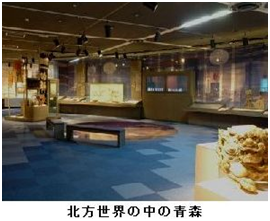 A large-scale rearrangement of Exhibition Room 3 (History) and added the Reconstruction and Development in Showa Period exhibition. A large-scale rearrangement of the Future Exhibition Room and added the regional learning room Waku Waku Experience Workshop. Amended the admission fees so that the group ticket is changed from 50% to 20% off, no concession fee for the age of 65 and over. Held a promotion project of regional arts and culture Traditional Folk Entertainment Special Performances in the Special Exhibition Hall on the First floor. Completion of the plumbing and drainage renovation work carried out based on the four year plan from 2006. Development of the browsing system according to the emergency economic measures in order to view items and material stored in the museum. 11th The Great East Japan Earthquake occurred. The epicenter was off the Sanriku coast, magnitude 9.0, the maximum Japanese seismic intensity 7. Huge tsunami more than 20 meters height occurred along the Sanriku coast on the Pacific coast. Japanese seismic intensity was 4 in Aomori City. 12th The museum was not damaged by the earthquake but was closed due to a power outage. 19th Closed Exhibition of New Collection 2010 until the end of March as an energy saving measure. ◆Number of visitors reached 2 million people. Closed until April 13 because there was no delivery of heating fuel due to the Great East Japan Earthquake. Mutsu koku Tsugaru gun no Ezu <Shoho Kuniezu Utsushi> (Paintings of Tsugaru region in Mutsu) designated as a prefectural cultural property. Partial Revision of the rules of the museum. Added information about the management of the facility by a specified administrator. Closed until March 31 due to construction work. Establishment of an outsourced management system for facilities management, public relations, and explanation of arts and literature department, and explainer tasks. 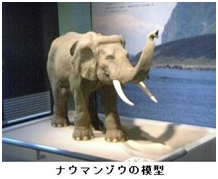 Renovation of Animals in Aomori Prefecture in the Natural History Exhibition Room. 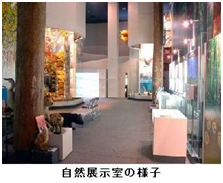 Exhibited Mammals in Aomori Prefecture and Birds in Aomori Prefecture, both stuffed exhibits and panels. In addition, re-edited the contents of Origins of Lake Towada, a video feature in The Land of Aomori Prefecture exhibition and added a terrain model. Completed the repair of The Nebuta (festival float) Kunibiki for the first time since the opening of the museum, and conducted a lighting ceremony. Celebrated the 40th anniversary of its opening. Renovation of Leading Forerunners from Aomori Exhibition Room. Changed from a panel exhibit to actual items. Installed large-scale replica panels of Mutsu koku Tsugaru gun no Ezu in the New Map exhibition of the History Exhibition Room. 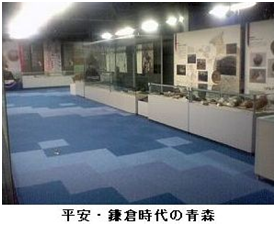 Established the Hikoei Narita Collection next to the Apples and Aomori Prefecture Exhibition Room. Sotogahama Kisho, written by Masumi Sugae, designated as a prefectural cultural property. Conducted large Hall ceiling repair work for seismic reinforcement. Closed the FUINDO Collection room on the first floor during the construction period until February 27, 2015. The trial version of Aomori Prefectural Digital Museum was released. The official version of the Aomori Prefectural Digital Museum was released. Permanent exhibitions were closed due to upgrades to the elevator and to the air conditioning equipment in the storage room. 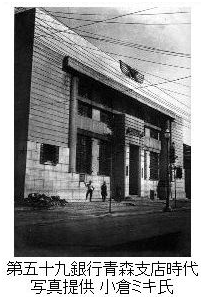 November 24, 1931 Completed as the Aomori branch office of the Fifty-Ninth Bank. 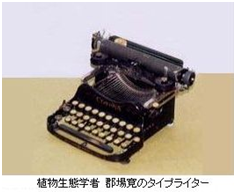 October 1, 1943 Became the head office of the Aomori Bank after the merger of five banks. July 28, 1945 Escaped from fire even though many buildings in Aomori city were destroyed by the Aomori air raids. 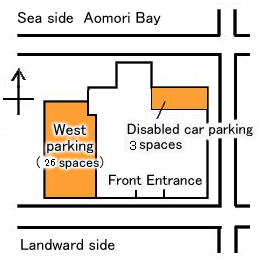 July 20, 1970 Aomori Bank Head Office was relocated to Hashimoto in Aomori City. 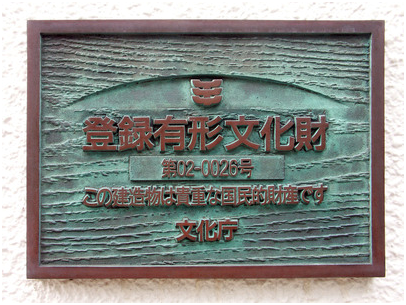 The former head office building was donated to Aomori Prefecture. September 20, 1973 Aomori Prefectural Museum opened. The building has been used as a special exhibition room since then. *The architect of this building is Koji Horie, the seventh son of Sakichi Horie, who designed the head office of the Fifty-Ninth Bank (currently the Aomori Bank Memorial Museum in Hirosaki City, an important cultural property). 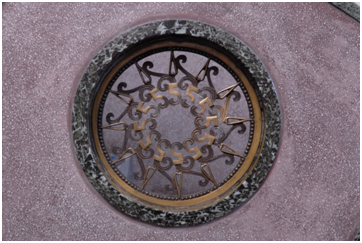 *The number 59, which has the same industrial design as the head office of the Fifty-Ninth Bank is decorated in relief on top of the pillars and the bannister emblems in the business office (currently, the large hall). 1995 Sent two and subsequently five more members, while receiving two, three, and subsequently two more members, and a special exhibition Nature and Culture of the Russian Far East was held in our museum. 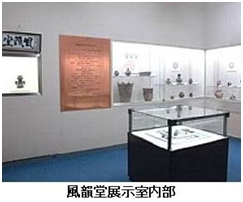 1997 Sent two and subsequently two more members, while receiving two, and subsequently two more members, and the special exhibition, Aomori is the Spirit of the North of Japan, was held in Khabarovsk Regional Museum. 1998 Concluded the agreement on joint academic research. Two people from Khabarovsk. 1999 Conducted joint academic research on nature (insects). Three staff members to/ from Khabarovsk. 2000 Conducted joint academic research on archeology (relics). Three staff members to/ from Khabarovsk. 2001 Conducted joint academic research on folklore (inland water fisheries). Three staff members to/ from Khabarovsk. 2002 Concluded the second joint academic research agreement. Sent three staff members to Khabarovsk and accepted three visitors for the first year’s research. 2003 Conducted a survey of the folklore study of the fishery. Three staff members to/from Khabarovsk. 2004 Conducted a survey of the subject of the ruins and relics in archaeological research in both Aomori and Khabarovsk. Three staff members to/ from Khabarovsk. July 2005 Conducted a survey of the nature based on the joint academic research agreement. Two staff members to/ from Khabarovsk. July 2006 Conducted a survey of the folklore based on the joint academic research agreement. Two staff members from Khabarovsk. 2014 Held Exchanged Photo Exhibition. In September, the Jomon Era exhibition was held in the Khabarovsk Region Museum, and Warm in North – The Evens – The People Living in Northern Russia - was held in our museum from November 2014 to February 2015. In 2015, both museums exchanged and displayed photos from each other's collection. In September, Khabarovsk Regional Museum held a photo exhibition titled "UNESCO World Heritage Site Shirakami Sanchi". In 2016, both museums exchanged and displayed photos from each other's collection. In September, Khabarovsk Regional Museum displayed "The Takashi Tsushima Photo Collection of The Birds of Aomori"
In January, Aomori Prefectural Folk Museum featured "The Museum's Still Photos" from Khabarovsk Regional Museum. Our museum and the Maine State Museum held special exhibitions to introduce our respective regional and cultural characteristics in 1997 and 1999. We will promote the exchange of literature and articles about each other. In addition, we will hold a small photo exhibition to display each other’s photos from time to time. 1996 Sent a museum staff member to a meeting about the exchange project. 1997 A special exhibition, Nature and Culture in Maine - Aomori and Maine Friendship Agreement Commemoration was held in our museum. 1999 A special exhibition, Aomori and Maine - Bridge beyond Time - was held in the Maine State Museum. 2000 Sent a member of the museum staff to discuss future exchange. 2001 Agreed to conduct academic research and send curators to each other in alternate years from 2002. 2002 Aborted the visit to Aomori from Maine. Secretary Level Council visited Aomori in October and agreed to review the exchange project. 2003 A museum staff member joined the Aomori Prefecture Secretary Level Council. They discussed future communication with the Maine State Museum in September 10. 2004 A special exhibition Sea and Industry in Maine was held in our museum for the 10th anniversary of the Aomori and Maine Friendship Agreement (from August 1 to 30). 2005 Confirmed the continuation of information and literature exchange with Maine in the meeting with the Prefecture Secretary Level Council.